Offer a secure shelter for toads in your garden with the Anthony Stoneware Toad House. Toads, like ladybugs, praying mantises, and lacewings, are an effective pest controller in gardens. A typical American toad can consume 50 to 100 slugs, flies, grasshoppers, and cutworms each evening, helping keep your garden free of pests. During the daytime, toads require a warm, humid hiding spot, easily provided using this Toad House. 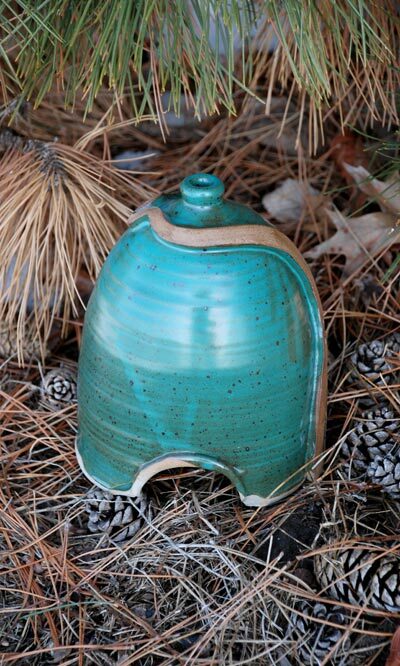 The vine-like adornment encircling the home offers texture that will allow moss to collect there, enhancing the teal green glaze and helping the item blend into your garden. This home is handmade from ceramic and then fired to 2400° Fahrenheit, to create a durable vitreous product that will withstand the rigors of time. The item will not decay, fade, or break down after exposure to UV light, for a long lasting unit. Create a home for your favorite garden amphibian with this Toad House. Made in the USA.